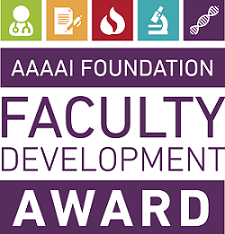 The AAAAI Foundation is pleased to announce the opening of the submission period for the 2019 Faculty Development Award on July 5. This award, which provides $240,000 in funding over a three-year period, is dedicated to support the development of junior faculty to further their careers in allergy/immunology. These awards help generate leaders and independent investigators by funding excellent research that will lead to the prevention and treatment of asthma and allergic and immunologic disease. The award term is July 1, 2019, to June 30, 2022. The timeline for the 2-step application process and details will be available online starting July 5, 2018, by visiting the AAAAI Grants and Awards page. For further information, contact Sabine Gifford at sgifford@aaaai.org. Every time you donate to the GAIN Campaign you’re supporting more A/I dedicated research in 2019. Donate today and fund a third Faculty Development Award in 2019. We’re proud of the scientists funded by members like you. Click here to view our 2018 Faculty Development awardees and our currently funded awardees. The Accreditation Council for Continuing Medical Education (ACCME) recently recognized the Training Stations presented at the 2018 AAAAI/WAO Congress in the “CME in Action” section of the ACCME Report as an example of diverse, flexible and quality CME. Read the blurb on the Training Stations. New employment opportunities within the specialty are available at the AAAAI Career Connections Center. Job seekers can upload their resumes, set up customized alerts for the types of jobs they are seeking and much more. As part of the scientific program for the EAACI Congress, I was asked to plan the AAAAI’s Sister Society Symposium titled “Food Allergy: The Best Papers this Year in JACI, CEA, and Allergy.” I was responsible for moderating as well as presenting important food allergy papers published in The Journal of Allergy and Clinical Immunology (JACI). I was joined by Cezmi A. Akdis, MD, FAAAAI, who highlighted the best food allergy papers from EAACI’s journal, Allergy, and Graham Roberts, DM, who highlighted the best food allergy papers from Clinical and Experimental Allergy (CEA). CEA is the official journal of the British Society for Allergy & Clinical Immunology. While in Munich, I had the opportunity to participate in two meetings with EAACI leadership. I presented to the EAACI Executive Committee, where I described current AAAAI activities and spoke about potential areas of collaboration between AAAAI and EAACI. In addition, there was a joint leadership meeting where we discussed topics such as the recruitment of medical students to the allergy/immunology (A/I) specialty, development of guidelines and support of A/I research in the United States and Europe. As you might imagine, we also have joint leadership meetings with EAACI at each AAAAI Annual Meeting. This is a natural way for our organizations to stay in touch on important issues that are facing the specialty. Another source of annual collaboration is our PRACTALL (Practical Allergy) meetings. Plans are already underway for our next PRACTALL, which AAAAI will host in October in Washington, DC. PRACTALL is an initiative between AAAAI and EAACI that aims to harmonize European and American approaches to best clinical practices and science in A/I. Each organization invites four participants, based on their subject-matter expertise, to attend the PRACTALL meeting where we discuss our diverse perspectives on these issues and recommend action. The end product is a PRACTALL consensus report that is published in our organizations’ respective journals. I am pleased that the topic for this fall’s PRACTALL is Immune Response Modifiers for the Treatment of Food Allergy. This is a hot topic in both research and clinical practice and I am delighted that Anna H. Nowak-Wegrzyn, MD, PhD, FAAAAI, Wayne G. Shreffler, MD, PhD, FAAAAI, and Wesley Burks, MD, FAAAAI, will join me in representing the AAAAI at this meeting. We are looking forward to an active discussion with our EAACI colleagues, leading to a state of the art publication in the JACI. I would like to express my gratitude and recognize EAACI President Ioana O. Agache, MD, PhD, for the successful EAACI Congress I experienced in Munich and for joining me in serving as Co-Chair for the upcoming PRACTALL. The AAAAI looks forward to continuing our collaborative efforts with EAACI for the good of our specialty and the patients we serve around the world.